A literary historical novel based on the lives of Katherine Mansfield, Ida Constance Baker and John Middlebury Murry.
" Lappin has built on textual evidence from journals, letters, and diary entries in order to adhere to “an overall sense of truth” which she renders as her own mosaic. Her writing style, with its rhythm, flow, and sensual detail, richly evokes the significant social scene of a vanished era. " "It's not an easy or siimple thing to write fiction which that keeps faith with the life it is based on, so the reader will say 'There is nothing here that falsifies', as well as 'This has the imaginative flair of story telling, the freedom of its form.' Linda Lappin has immersed herself in Mansfield's life, and emerged from it with a story to to narrate on her own terms, a fiction charged with the enthusiasm of a good researcher, and carried through with a novelist's verve." "A dramatic retelling of a story about an artist oppressed by the odds, [Katherine's Wish] gives narrative to the chaotic last years of [Katherine Mansfield's] life. 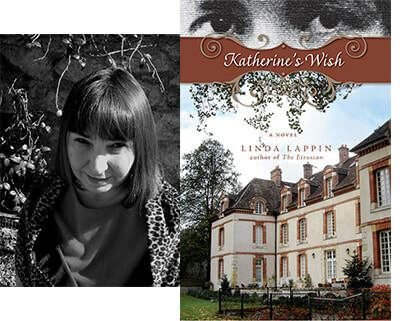 Lappin draws from letters and other historical documents to bring the last years of Mansfield's life into bring, making Katherine's Wish an intriguing and highly recommended piece of writing." ​"Katherine's Wish is a beautifully observed novel [that] reveals a core truth: that Mansfield's was not so much a creative life cut short as one that flourished so long against all odds." "Katherine's Wish, fifteen years in the making, is a dazzling bit of fictional sorcery, conjuring to life the bright and talented swirl of modern society in the 1920s... This novel is a must read, whether you have historical interests per se or only enjoy a story so compelling and moving that there's no putting it down. I certainly couldn't!" ​"The author of two critically successful historical novels, Prisoner of Palmary andThe Etruscan, Linda Lappin turns her gifted hand to fictional biography in Katherine's Wish... Like the 'new biography' of Lytton Strachery and analogous fiction by Virginia Wolff, Lappin's fictional life of Mansfield recreates the ineffable, 'rainbow-like' essence of a human being from the inside perspective of three people: Mansfield herself, her traveling friend Ida Baker, and [her husband, John Middleton] Murry." Linda Lappin is the author of The Etruscan (Wynkin de Worde, Galway, 2004) hailed by critics as a new classic in American writing about Italy . Semi-Finalist for the 2000 Three Oaks First Novel Prize awarded by Story-Line Press, in Oregon, The Etruscan was selected as a Book of the Week by Book View Ireland and praised by the Literary Review as "compelling, haunting, intriguing," and by Prairie Schooner as "gorgeously detailed, wickedly fun." She is also the author of Prisoner of Palmary, an experimental historical novel set in 18th century Italy, short-listed for the Mid-List First Novel Award in 1999. Her essays, poetry, reviews and fiction have appeared in a wide avriety of US publications, from the Kenyon Review to the Kansas City Star. She has twice been nominated for a Pushcart Prize. The last chapter of Katherine's Wish was short-listed for the Eric Hoffer short fiction award in 2007 and was published in Best New Writing 2007. She teaches Creative Writing for the U.S.A.C. Study Abroad program in Viterbo. She also directs the Writing Center of Centro Pokkoli www.pokkoli.org Her forthcoming books include Signatures in Stone, a mystery novel set in Bomarzo, Italy, and Spirits of Place, a creative writing textbook.